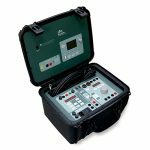 The PTE-300-V equipment is a universal, portable, test system with three outputs to test single and three phase protective relays. 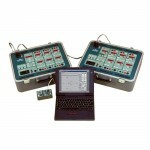 The equipment compromises of three independent output channels than can be selected as voltage or current. 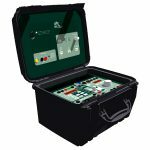 This enables the unit to be used as a complete single-phase equipment (Voltage, Current, and phase angle between them), or with channels synchronized, as a three phase voltage or three phase current generator from a single phase mains input. 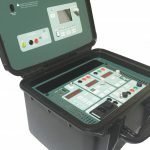 The unit is extremely compact and rugged. The design incorporates the latest in modern digital microprocessor technology to achieve unbeatable output characteristics in terms of power, accuracy, low distortion, and dynamic capability. 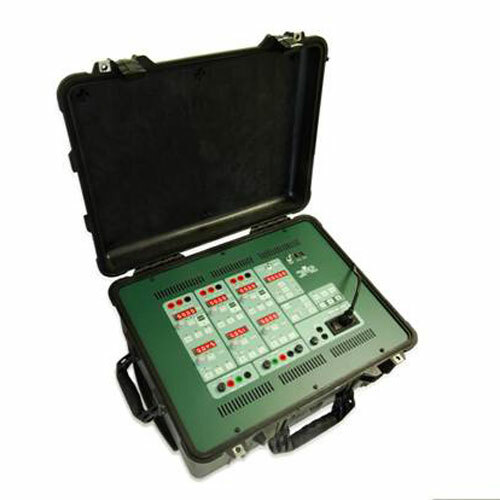 This technology allows users to test many different specific functions required in relay testing, without the need of additional accessories. All output signals are digitally generated, amplified, and internally controlled by the IGM’s (Intelligent Generator Modules), which interpret the orders received from the front panel to produce a highly accurate, stable, and low distorted output, independent of the voltage supply. 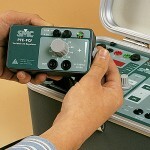 The equipment also allows optional connection to a computer for either automatic testing of relays or control of the equipment using Windows compatible software. 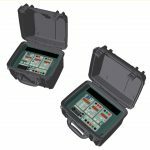 Even the adjustment and calibration of the equipment is made by software, supplied with the units, which permits calibration and/or adjustments in the outputs, without any manual hardware setting. 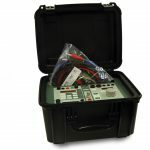 (Closed Case Calibration) In summary, the PTE-300-V is an equipment which offers all the characteristics and functions needed for protective relay testing, in a manual or automatic mode, and in laboratory and/or for on site testing. Variable three phase voltage to 3 x 300V or Current up to 3 x 8A. Variable phase angle between 0 – 359.9° (Single or three phase). Variable frequency output between 40 – 420 Hz. 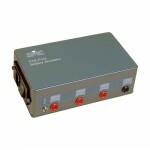 Output power: 3 x 100 VA.
Outputs are fully isolated and electronic. 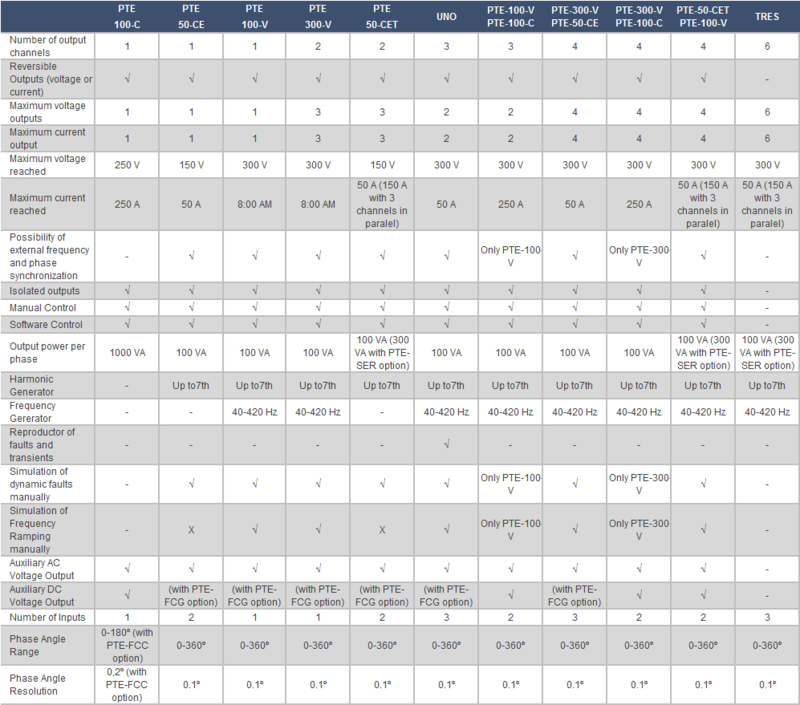 External frequency or phase reference input. Dimensions: 200 x 442 x 327 mm / 22 Kg 8 x 18 x 13 in. / 48 lb. Testing of three and single phase Generation and Interconnection Relays. 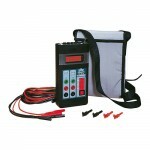 Combined with a single phase Current injection set, allows relay tests which require three phase voltage. Can be used as a complete single phase unit in voltage, current, and phase as outputs are reversible (V, I, j ).